The Rockwell Family Has Moved In! The jointer is ready to go! Anyway, while the most time consuming part of "restoring" this tool was resurfacing the fence and wings, figuring out how to take it apart and put it back together was actually more difficult. The fence is obvious. Just a block of steel that slides along the end of one of the wings, and is tightened by a cap nut and cam lever. The outfeed wing came off easily. 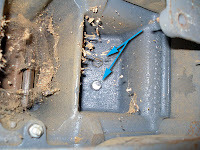 Remove the 3 setscrews, use a screwdriver to push the aluminum bushing plate out through the bottom, unscrew the adjustment knob all the way, and lift the wing out. 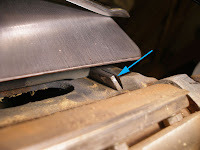 The photo on the left shows the three setscrews and the photo below shows the bushing peeking out (arrow). In fact, it was so easy I didn't mention it in my previous post. The infeed side wasn't as forgiving. The hook that goes around the cutter head kept it from being fully backed out like the outfeed wing. So I had to find another solution. When I flipped the jointer over, I found that each wing had 2 bolts. Happily, a 13mm socket fit it since I had lent my SAE tools to a friend. 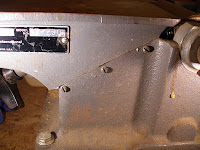 The two bolts attached the part the adjustment screw threaded through. Removing the bolts allowed me to lift the wing off once the setscrews and bushing were removed. 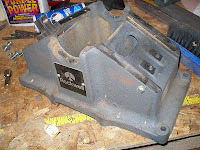 Now that I was down to the core of the jointer, I had to figure out how to get the cutter head out. Turned out to be easy. There are two long threaded rods that go down through the casting from the cutter head and just have nuts with lock washers under them. I also removed the riser base. 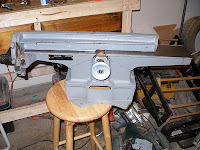 It's a cast iron skirt that raises the jointer up to where the pulley is at the same height as the one in the table saw, allowing the use of the shared motor. With everything apart, I scrubbed it up with Purple Power cleaner. The paint was in excellent condition, so other than cleaning, I didn't do anything else. I did find some runs from resin or something that wouldn't come clean. (I doubt it's resin but whatever). It appeared it would take an abrasive or something to get it off. The risk of damaging the paint wasn't worth making more effort to remove it. It's purely cosmetic, so I'm leaving it along. As I mentioned before, this is *NOT* a true restoration, but is instead a "let's clean it up and use it". 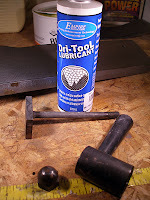 I applied a dry lubricant per the instructions on the bottle: Spray the components, work them through the full range of motion, remove and spray again, let dry. This product in the photo worked great. 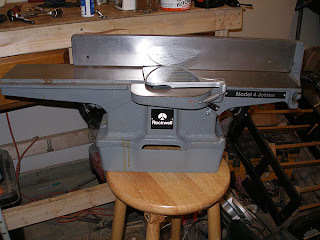 I can't wait to finish the table saw so I can try this puppy out!